Speeco S40144200 innovative 4-Way Wedge slips over the standard wedge offered with SpeeCo and Huskee log splitters. This design allows the operator to switch between 2-Way and 4-Way Wedges in seconds. This model works on 22t & 25t Splitters. This item ships direct from the manufacturer and can take 1-3 days to process the order and 4-5 days shipping time. This wedge is a good design for its intended purpose. I would just heed the warning about hardwood. It does hold up if everything you are splitting is absolutely straight. But the top plate that is welded on is too thin to handle any kind of crotch. I broke mine within 30 minutes. The welds were excellent and not a problem. The top plate started to bend and the plate cracked while splitting a piece of white oak with a hidden crotch that I failed to back off when splitting. It may very well be an intended/unintended design feature that keeps you from damaging your splitter. on 9/23/2011 Great 4 way wedge !! 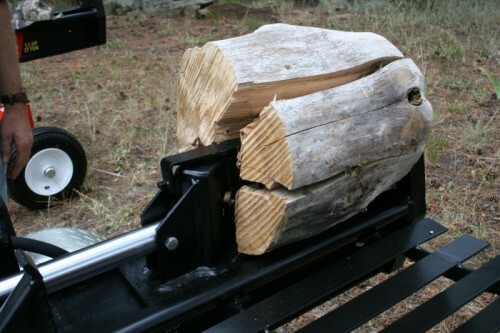 I ordered this speeco 4 way splitting wedge for my Speeco Log Splitter. I was a little hesitant to buy it because if you notice, there is a disclaimer that it is for soft woods only. I only split and burn hardwoods such as red/white oak, birch, maple etc. I am happy to say that after a spring and summer of splitting a winters' worth of wood (approx. 4-5 cords)with it, it has worked absolutely perfectly and is holding up just perfectly. I blasted through so many huge hardwood logs with ease. It is designed extremely well with great solid steel construction and huge solid welds. I am sure that I will own it for a long time. I don't usually write reviews but I thought that if there is someone else out there like me who is on the fence about this wedge because of the soft-woods disclaimer, I would recommend buying it and you will see that it will work just great for you too !